i) „regular services” means services which provide for the carriage of passengers at specified intervals along specified routes, passengers being taken up and set down at predetermined stopping points. Rules governing the operations of services or documents taking the place thereof, approved by the competent authorities of Contracting Parties and published by the carrier before coming into operation, shall specify the conditions of carriage and in particular the frequency of services, timetables, faretables and the obligation to accept passengers for carriage, insofar as such conditions are not prescribed by any law or regulation. m) „rest” means any uninterrupted period of at least one hour during which the driver may freely dispose of his time. 1. This Agreement shall apply in the territory of each Contracting Party to all international road transport performed by any vehicle registered in the territory of the said Contracting Party or in the territory of any other Contracting Party. 1. Vehicles, used for the carriage of goods where the permissible maximum weight of the vehicle, including any trailer or semi trailer, does not exceed 3.5 tonnes. 2. Vehicles used for the carriage of passengers which, by virtue of their construction and equipment are suitable for carrying not more than nine persons, including the driver, and are intended for that purpose. 3. Vehicles used for the carriage of passengers on regular services where the route covered by the service in question does not exceed 50 kilometres. 4. Vehicles with a maximum authorized speed not exceeding 30 kilometres per hour. 5. Vehicles used by or under the control of the armed services, civil defence, fire services, and forces responsible for maintaining public order. 6. Vehicles used in connection with the sewerage, flood protection, water, gas and electricity services, highway maintenance and control, refuse collection and disposal, telegraph and telephone services, carriage of postal articles, radio and television broadcasting and the detection of radio or television transmitters or receivers. 7. Vehicles used in emergencies or rescue operations. 8. Specialized vehicles used for medical purposes. 9. Vehicles transporting circus and funfair equipment. 11. Vehicles undergoing road tests for technical development, repair or maintenance purposes, and new or rebuilt vehicles which have not yet been put into service. 12. Vehicles used for non commercial carriage of goods for personal use. 13. Vehicles used for milk collection from farms and the return to farms of milk containers or milk products intended for animal feed. 1. Each Contracting Party shall apply in its territory, in respect of international road transport performed by any vehicle registered in the territory of a State which is not a Contracting Party to this Agreement, provisions not less strict than those laid down in articles 5, 6, 7, 8, 9 and 10 of this Agreement. 2. It shall be open to any Contracting Party, in the case of a vehicle registered in a State which is not a Contracting Party to this Agreement, merely to require, in lieu of a control device conforming to the specifications in the annex to this Agreement, daily record sheets, completed manually by the driver. Each Contracting Party may apply higher minima or lower maxima than those laid down in articles 5 to 8 inclusive. Nevertheless, the provisions of this Agreement shall remain applicable to drivers, engaged in international road transport operations on vehicles registered in another Contracting or non Contracting State. 18 years provided that the person concerned holds a certificate of professional competence recognized by one of the Contracting Parties confirming that he has completed a training course for drivers of vehicles intended for the carriage of goods by road. Contracting Parties shall inform one another of the prevailing national minimum training levels and other relevant conditions relating to drivers engaged in international carriage of goods under this Agreement. 2. Any driver engaged in the carriage of passengers shall have reached the age of 21 years. c) he must hold a certificate of professional competence recognized by one of the Contracting Parties confirming that he has completed a training course for drivers of vehicles intended for the carriage of passengers by road. 1. The driving period between any two daily rest periods or between a daily rest period and a weekly rest period, hereinafter called „daily driving period”, shall not exceed nine hours. It may be extended twice in any one week to ten hours. A driver must, after no more than six daily driving periods, take a weekly rest period as defined in article 8 (3). The weekly rest period may be postponed until the end of the sixth day if the total driving time over the six days does not exceed the maximum corresponding to six daily driving periods. In the case of the international carriage of passengers, other than on regular services, the terms „six” and „sixth” in the second and third subparagraphs shall be replaced by „twelve” and „twelfth” respectively. 2. The total period of driving in any one fortnight shall not exceed ninety hours. 1. After four and a half hours’ driving, the driver shall observe a break of at least forty five minutes, unless he begins a rest period. 2. This break may be replaced by breaks of at least fifteen minutes each distributed over the driving period or immediately after this period in such a way as to comply with the provisions of paragraph 1. 3. During these breaks, the driver may not carry out any other work. For the purposes of this article, the waiting time and time not devoted to driving spent in a vehicle in motion, a ferry, or a train shall not be regarded as „other work”. 4. The breaks observed under this article may not be regarded as daily rest periods. 1. In each period of twenty four hours, the driver shall have a daily rest period of at least eleven consecutive hours, which may be reduced to a minimum of nine consecutive hours not more than three times in any one week, on condition that an equivalent period of rest be granted as compensation before the end of the following week. On days when the rest is not reduced in accordance with the first subparagraph, it may be taken in two or three separate periods during the twenty four hour period, one of which must be of at least eight consecutive hours. In this case the minimum length of the rest shall be increased to twelve hours. 2. During each period of thirty hours when a vehicle is manned by at least two drivers, each driver shall have a rest period of not less than eight consecutive hours. 3. In the course of each week, one of the rest periods referred to in paragraphs 1 and 2 shall be extended by way of weekly rest, to a total of forty five consecutive hours. This rest period may be reduced to a minimum of thirty six consecutive hours if taken at the place where the vehicle is normally based or where the driver is based, or to a minimum of twenty four consecutive hours if taken elsewhere. Each reduction shall be compensated by an equivalent rest taken en bloc before the end of the third week following the week in question. 4. A weekly rest period which begins in one week and continues into the following week may be attached to either of these weeks. 5. In the case of the carriage of passengers to which article 6 (1), fourth subparagraph, applies, the weekly rest period may be postponed until the week following that in respect of which the rest is due and added on to that second week's weekly rest. 6. Any rest taken as compensation for the reduction of the daily and/or weekly rest periods must be attached to another rest of at least eight hours and shall be granted, at the request of the person concerned, at the vehicle's parking place or driver's base. 7. The daily rest period may be taken in a vehicle, as long as it is fitted with a bunk and is stationary. The daily rest period, interrupted in this way, shall be increased by two hours. Provided that road safety is not thereby jeopardized and to enable him to reach a suitable stopping place, the driver may depart from the provisions of this Agreement to the extent necessary to ensure the safety of persons, of the vehicle or of its load. The driver shall indicate the nature of and reason for his departure from those provisions on the record sheet of the control device or in his duty roster. a) The control device shall as regards construction, installation, use and testing, comply with the requirements of this Agreement and the annex thereto, which shall form an integral part of this Agreement. A control device which as regards construction, installation, use and testing complies with Council Regulation (EEC) No. 3821/85 of 20 December 1985 shall be deemed to be in compliance with the requirements of this article. b) If the normal and appropriate use of a control device installed on a vehicle is not possible, each crew member shall enter by hand, using the appropriate graphic representation, the details corresponding to his occupational activities and rest periods on his record sheet. c) When, by reasons of their being away from the vehicles, the crew members are unable to make use of the device, they shall insert by hand, using the appropriate graphic representation, on their record sheet the various times corresponding to their occupational activities while they were away. d) The crew members must always have available, and be able to present for inspection record sheets for the current week and for the last day of the previous week on which they drove. e) The crew members must ensure that the control device be activated and handled correctly and that, in case of malfunctioning, it be repaired as soon as possible. 2. The employer shall issue a sufficient number of record sheets to drivers, bearing in mind the fact that these sheets are personal in character, the length of the period of service and the possible obligation to replace sheets which are damaged, or have been taken by an authorized inspecting officer. The employer shall issue to drivers only sheets of an approved model suitable for use in the equipment installed in the vehicle. 3. Undertakings shall keep in good order the record sheets filled in as provided under b), c) and d) of paragraph 1 of this article, for a period of not less than 12 months after the date of the last entry and shall produce them at the request of the control authorities. 1. The undertaking shall so organize road transport operations that crew members are able to comply with the provisions of this Agreement. 2. It shall make a regular check of driving periods, hours of other work and rest periods by referring to all documents at its disposal such as the individual control books. Should it discover any breach of this Agreement it shall take prompt action to end it and to avoid its repetition, for example by changing hours of work and routes. 3. Payments to wage earning drivers, even in the form of bonuses or wage supplements, related to distances travelled and/or the amount of goods carried shall be prohibited, unless these payments are of such a kind as not to endanger road safety. 1. Each Contracting Party shall adopt all appropriate measures to ensure observance of the provisions of this Agreement, in particular by adequate level of road checks and checks performed on the premises of undertakings. The competent administrations of the Contracting Parties shall keep one another informed of the general measures adopted for this purpose. 2. Contracting Parties shall assist each other in applying this Agreement and in checking compliance therewith. penalties imposed by a Contracting Party on its residents for such breaches committed on the territory of Contracting Party. In case of serious breaches such information shall include the penalty imposed. 4. If the findings of a roadside check on the driver of a vehicle registered in the territory of another Contracting Party provide grounds to believe that infringements have been committed which cannot be detected during the check due to lack of necessary data, the competent authorities of the Contracting Party concerned shall assist each other to clarify the situation. In cases where, to this end, the competent Contracting Party carries out a check at the premises of the undertaking, the results of this check shall be communicated to the other Party concerned. The provisions of new article 10 Control device, shall not become mandatory for countries Contracting Parties to this Agreement until 24 April 1995. Before that date the provisions of the old article 12 Individual control book, and the old article 12 bis Control device, shall continue to apply. 1. This Agreement shall be open for signature until 31 March 1971 and thereafter for accession, by States members of the Economic Commission for Europe and States admitted to the Commission in a consultative capacity under paragraph 8 of the Commission’s terms of reference. 2. This Agreement shall be ratified. 3. The instruments of ratification or accession shall be deposited with the Secretary General of the United Nations. 4. This Agreement shall enter into force on the one hundred and eightieth day after the date of deposit of the eighth instrument of ratification or accession. 5. In respect of each State which ratifies, or accedes to, this Agreement after the deposit of the eighth instrument of ratification or accession as referred to in paragraph 4 of this article, the Agreement shall enter into force one hundred and eighty days after the deposit by that State of its instrument of ratification or accession. 1. Any Contracting Party may denounce this Agreement by notice addressed to the Secretary General of the United Nations. 2. The denunciation shall take effect six months after the date on which the Secretary General receives notice thereof. This Agreement shall cease to have effect if for any period of twelve consecutive months after its entry into force the number of Contracting Parties is less than three. 1. Any State may, at the time of signing this Agreement or of depositing its instrument of ratification or accession or at any time thereafter, declare by notification addressed to the Secretary General of the United Nations that the validity of the Agreement shall be extended to all or any of the territories for the international relations of which it is responsible. The Agreement shall apply to the territory or territories named in the notification as from the one hundred and eightieth day after receipt of the notification by the Secretary General or, if on that day the Agreement has not yet entered into force, as from the date of its entry into force. 2. Any State which has made a declaration under the preceding paragraph making this Agreement applicable to a territory for whose international relations it is responsible may denounce the Agreement separately in respect of that territory in conformity with the provisions of article 15 hereof. 1. Any dispute between two or more Contracting Parties concerning the interpretation or application of this Agreement shall so far as possible be settled by negotiation between them. 2. Any dispute which is not settled by negotiation shall be submitted to arbitration if any one of the Contracting Parties concerned in the dispute so requests and shall accordingly be referred to one or more arbitrators selected by agreement between the Parties in dispute. If within three months from the date of the request for arbitration the Parties in dispute are unable to agree on the selection of an arbitrator or arbitrators, any of those Parties may request the Secretary General of the United Nations to appoint a single arbitrator to whom the dispute shall be referred for decision. 3. The decision of the arbitrator or arbitrators appointed under the preceding paragraph shall be binding on the Contracting Parties in dispute. 1. Any State may, at the time of signing, ratifying, or acceding to this Agreement, declare that it does not consider itself bound by article 18, paragraphs 2 and 3 hereof. The other Contracting Parties shall not be bound by the said paragraphs with respect to any Contracting Party which has entered such a reservation. 2. If at the time of depositing its instrument of ratification or accession a State enters a reservation other than that provided for in paragraph 1 of this article, the Secretary General of the United Nations shall communicate the reservation to the States which have previously deposited their instruments of ratification or accession and have not since denounced this Agreement. The reservation shall be deemed to be accepted if none of the said States has, within six months after such communication, expressed its opposition to acceptance of the reservation. Otherwise the reservation shall not be admitted, and, if the State which entered the reservation does not withdraw it the deposit of that State's instrument of ratification or accession shall be without effect. For the purpose of the application of this paragraph the opposition of States whose accession or ratification is, in virtue of this paragraph without effect by reason of reservations entered by them, shall be disregarded. 3. Any Contracting Party whose reservation has been adopted in the Protocol of signature of this Agreement or who has entered a reservation pursuant to paragraph 1 of this article, or made a reservation which has been accepted pursuant to paragraph 2 of this article may at any time withdraw such reservation by a notification addressed to the Secretary General. 1. After this Agreement has been in force for three years any Contracting Party may, by a notification addressed to the Secretary General of the United Nations, request that a conference be convened for the purpose of revising the Agreement. The Secretary General shall notify all Contracting Parties of the request and shall convene a revision conference if not less than one third of the Contracting Parties signify their assent to the request within a period of four months from the date of the notification by the Secretary General. 2. If a conference is convened in conformity with the preceding paragraph the Secretary General shall notify all the Contracting Parties and invite them to submit within a period of three months such proposals as they wish the conference to consider. The Secretary General shall circulate to all Contracting Parties the provisional agenda for the conference, together with the text of such proposals, not less than three months before the date on which the conference is to meet. 3. The Secretary General shall invite to any conference convened under this article all the States referred to in article 14, paragraph 1, of this Agreement. 1. Any Contracting Party may propose one or more amendments to this Agreement. The text of any proposed amendment shall be communicated to the Secretary General of the United Nations, who shall communicate it to all Contracting Parties and inform thereof all the other States referred to in article 14, paragraph 1, of this Agreement. b) that, although it intends to accept the proposal, the conditions necessary for such acceptance are not yet fulfilled in its State. 3. If a Contracting Party sends to the Secretary General a communication such as is provided for in paragraph 2 b) of this article, it may, so long as it has not notified the Secretary General of its acceptance of the proposed amendment, submit an objection to the proposed amendment within a period of nine months following the expiry of the six month period provided for its communication. 4. If an objection to the proposed amendment is stated in accordance with the terms of paragraphs 2 and 3 of this article, the amendment shall be deemed not to have been accepted and shall be of no effect. - the date of expiry of the period of nine months referred to in paragraph 3 of this article. 6. Any amendment deemed to be accepted shall enter into force three months after the date on which it was deemed to be accepted. 7. The Secretary General shall as soon as possible notify all Contracting Parties whether an objection to the proposed amendment has been stated under paragraph 2 a) of this article and whether he has received from one or ,more Contracting Parties a communication under paragraph 2 b) of this article. If he has received such a communication from one or more Contracting Parties, he shall subsequently inform all the Contracting Parties whether the Contracting Party or Parties which have made such a communication raise an objection to or accept the proposed amendment. 8. Independently of the amendment procedure laid down in paragraphs 1 to 6 of this article, the annex to this Agreement may be modified by agreement between the competent administrations of all the Contracting Parties; if the competent administration of a Contracting Party has stated that under its domestic law its agreement is contingent on special authorization for the purpose, or on the approval of a legislative body, the consent of the competent administration of the Contracting Party concerned to the modification of the annex shall not be deemed to have been given until the said competent administration has notified the Secretary General that the necessary authorization or approval has been obtained. The agreement between the competent administrations shall appoint the date of entry into force of the modified annex, and may provide that, during a transitional period, the old annex shall remain in force, wholly or in part, concurrently with the modified annex. 1. Appendices 1 and 2 to the annex to this Agreement may be amended by the procedure specified in this article. 2. At the request of a Contracting Party, any amendments proposed to appendices 1 and 2 to the annex to this Agreement shall be considered by the Principal Working Party on Road Transport of the Economic Commission for Europe. 3. If it is adopted by the majority of the members present and voting, and if this majority includes the majority of the Contracting Parties present and voting, the amendment shall be communicated by the Secretary General to the competent administrations of all the Contracting Parties for acceptance. 4. The amendment shall be accepted if, within a period of six months following the date of notification, less than one third of the competent administrations of the Contracting Parties notify the Secretary General of their objection to the amendment. 5. Any amendment accepted shall be communicated by the Secretary General to all the Contracting Parties and shall come into force three months after the date of its notification. g) the entry into force of any amendment in conformity with article 21 of this Agreement. The Protocol of signature of this Agreement shall have the same force, validity and duration as the Agreement itself, of which it shall be deemed to be an integral part. After 31 March 1971 the original of this Agreement shall be deposited with the Secretary General of the United Nations, who shall transmit certified true copies to each of the States referred to in article 14, paragraph 1, hereof. Applications for the approval of a type of control device or of a model record sheet shall be submitted, accompanied by the appropriate specifications, by the manufacturer or his agent to a Contracting Party. No application in respect of any one type of control device or of any one model record sheet may be submitted to more than one Contracting Party. A Contracting Party shall grant its approval to any type of control device or to any model record sheet which conforms to the requirements laid down in appendix 1 to this annex, provided that the Contracting Party is in a position to check that production models conform to the approved prototype. Any modifications or additions to an approved model must receive additional type approval from the Contracting Party which granted the original type approval. Contracting Parties shall issue to the applicant an approval mark, which shall conform to the model shown in appendix 2 for each type of control device or model record sheet which they approve pursuant to article 2. The competent authorities of the Contracting Party to which the application for type approval has been submitted shall, in respect of each type of control device or model record sheet which they approve or refuse to approve, either send within one month to the authorities of the other Contracting Parties a copy of the approval certificate accompanied by copies of the relevant specifications, or, if such is the case, notify those authorities that approval has been refused; in cases of refusal they shall communicate the reasons for their decision. 1. If a Contracting Party which has granted the type approval as provided for in article 2 finds that certain control device or record sheets bearing the type approval mark which it has issued do not conform to the prototype which it has approved, it shall take the necessary measures to ensure that production models conform to the approved prototype. The measures taken may, if necessary, extend to withdrawal of the type approval. 2. A Contracting Party which has granted the type approval shall withdraw such approval if the control device or record sheet which has been approved is not in conformity with this annex or its appendices or displays in use any general defect which makes it unsuitable for the purpose for which it is intended. 3. If a Contracting Party which has granted the type approval is notified by another Contracting Party of one of the cases referred to in paragraphs 1 and 2, it shall also, after consulting the latter Contracting Party, take the steps laid down in those paragraphs, subject to paragraph 5. 4. A Contracting Party which ascertains that one of the cases referred to in paragraph 2 has arisen may forbid until further notice the placing on the market and putting into service of the control device or record sheets. The same applies in the cases mentioned in paragraph 1 with respect to control device or record sheets which have been exempted from the initial verification, if the manufacturer, after due warning, does not bring the device into line with the approved model or with the requirements of this annex. In any event, the competent authorities of the Contracting Parties shall notify one another within one month, of any withdrawal of the type approval or of any other measures taken pursuant to paragraphs 1, 2 and 3 and shall specify the reasons for such action. 5. If a Contracting Party which has granted the type approval disputes the existence of any of the cases specified in paragraphs 1 or 2 notified to it, the Contracting Parties concerned shall endeavour to settle the dispute. 1. An applicant for the type approval of a model record sheet shall state on his application the type or types of control device on which the sheet in question is designed to be used and shall provide suitable equipment of such type or types for the purpose of testing the sheet. 2. The competent authorities of each Contracting Party shall indicate on the approval certificate for the model record sheet the type or types of control device on which that model sheet may be used. No Contracting Party may refuse to register any vehicle fitted with a control device, or prohibit the entry into service or use of such vehicle for any reason connected with the fact that the vehicle is fitted with such device, if the device bears the approval mark referred to in article 3 and the installation plaque referred to in article 9. All decisions pursuant to this annex refusing or withdrawing approval of a type of control device or model record sheet shall specify in detail the reasons on which they are based. A decision shall be communicated to the party concerned, who shall at the same time be informed of the remedies available to him under the laws of the Contracting Party and of the time limits for the exercise of such remedies. 1. The control device may be installed or repaired by fitters or workshops approved by the competent authorities of Contracting Parties for that purpose after the latter, should they so desire, have heard the views of the manufacturers concerned. 2. The approved fitter or workshop shall place a special mark on the seals which it affixes. The competent authorities of the Contracting Party shall maintain a register of the marks used. 3. The competent authorities of the Contracting Parties shall send each other their lists of approved fitters or workshops and also copies of the marks used. 4. For the purpose of certifying that installation of control device took place in accordance with the requirements of this annex an installation plaque affixed as provided in appendix 1 shall be used. The employer and drivers shall be responsible for seeing that the device functions correctly. 2. Drivers shall use the record sheets every day on which they are driving, starting from the moment they take over the vehicle. The record sheet shall not be withdrawn before the end of the daily working period unless its withdrawal is otherwise authorized. No record sheet may be used to cover a period longer than that for which it is intended. When, as a result of being away from the vehicle, a driver is unable to use the device fitted to the vehicle, the periods of time shall be entered on the sheet, either manually, by automatic recording or other means, legibly and without dirtying the sheet. Drivers shall amend the record sheets as necessary should there be more than one driver on board the vehicle, so that the information referred to in Chapter II (1) to (3) of appendix 1 is recorded on the record sheet of the driver who is actually driving. 3. The control device shall be so designed that it is possible for an authorized inspecting officer, if necessary after opening the equipment, to read the recordings relating to the nine hours preceding the time of the check without permanently deforming, damaging or soiling the sheet. The control device shall, furthermore, be so designed that it is possible, without opening the case, to verify that recordings are being made. 4. Whenever requested by an authorized inspecting officer to do so, the driver must be able to produce record sheets for the current week, and in any case for the last day of the previous week on which he drove. e) „effective circumference of wheel tyres” means the average of the distances travelled by the several wheels moving the vehicle (driving wheels) in the course of one complete rotation. The measurement of these distances must be made under normal test conditions (see chapter VI, paragraph 4 of this appendix) and is expressed in the form: 1 = ... mm. 7. for electronic control device which is device operating by signals transmitted electrically from the distance and speed sensor, any interruption exceeding 100 milliseconds in the power supply of the recording equipment (except lighting), in the power supply of the distance and speed sensor and any interruption in the signal lead to the distance and speed sensor. For vehicles used by two drivers the control device must be capable of recording simultaneously but distinctly and on two separate sheets details of the periods listed under 3, 4 and 5.
one or more time recorders satisfying the requirements laid down in chapter III C 4.
for electronic control device, as defined in point 7 of chapter II, any interruption exceeding 100 milliseconds in the power supply of the distance and speed sensor and any interruption in the signal lead to the distance and speed sensor. 2. Any inclusion of the equipment of devices additional to those listed above must not interfere with the proper operation of the mandatory devices or with the reading of them. The control device must be submitted for approval complete with any such additional devices. a) All the constituent parts of the control device must be made of materials with sufficient stability and mechanical strength and stable electrical and magnetic characteristics. b) Any modification in a constituent part of the control device or in the nature of the materials used for its manufacture must, before being applied in manufacture, be submitted for approval to the authority which granted type approval for the control device. a) The range of speed measurement shall be as stated in the type approval certificate. b) The natural frequency and the damping of the measuring device must be such that the instruments showing and recording the speed can, within the range of measurement, follow acceleration changes of up to 2 m/s2, within the limits of accepted tolerances. a) The control of the mechanism for resetting the clock must be located inside a case containing the record sheet; each opening of that case must be automatically recorded on the record sheet. b) If the forward movement mechanism of the record sheet is controlled by the clock, the period during which the latter will run correctly after being fully wound must be greater by at least 10% than the recording period corresponding to the maximum sheet load of the equipment. a) The visual instruments of the control device must be provided with adequate non dazzling lighting. b) For normal conditions of use, all the internal parts of the control device must be protected against damp and dust. In addition they must be made proof against tampering by means of casings capable of being sealed. a) The value of the smallest grading on the control device showing distance travelled must be 0.1 kilometres. Figures showing hectometres must be clearly distinguishable from those showing whole kilometres. b) The figures on the distance recorder must be clearly legible and must have an apparent height of at least 4 mm. c) The distance recorder must be capable of reading up to at least 99,999.9 kilometres. a) Within the range of measurement, the speed scale must be uniformly graduated by 1, 2, 5 or 10 kilometres per hour. The value of a speed graduation (space between two successive marks) must not exceed 10% of the maximum speed shown on the scale. b) The range indicated beyond that measured need not be marked by figures. c) The length of each space on the scale representing a speed difference of 10 kilometres per hour must not be less than 10 millimetres. d) On an indicator with a needle, the distance between the needle and the control device face must not exceed 3 millimetres. The time indicator must be visible from outside control device and give a clear, plain and unambiguous reading. a) All equipment, whatever the form of the record sheet (strip or disc) must be provided with a mark enabling the record sheet to be inserted correctly, in such a way as to ensure that the time shown by the clock and the time marking on the sheet correspond. b) The mechanism moving the record sheet must be such as to ensure that the latter moves without play and can be freely inserted and removed. c) For record sheets in disc form, the forward movement device must be controlled by the clock mechanism. In this case, the rotating movement of the sheet must be continuous and uniform, with a minimum speed of 7 millimetres per hour measured at the inner border of the ring marking the edge of the speed recording area. d) Recording of the distance travelled, of the speed of the vehicle and of any opening of the case containing the record sheet or sheets must be automatic. a) Every kilometre of distance travelled must be represented on the record by a variation of at least 1 millimetre on the corresponding coordinate. b) Even at speeds reaching the upper limit of the range of measurement, the record of distances must still be clearly legible. a) Whatever the form of the record sheet, the speed recording stylus must normally move in a straight line and at right angles to the direction of travel of the record sheet. the markings on the timescale must cross the recording area in a curve of the same radius as the trace drawn by the stylus. The spaces between the markings on the timescale must represent a period not exceeding one hour. b) Each variation in speed of 10 kilometres per hour must be represented on the record by a variation of at least 1.5 millimetres on the corresponding coordinate. Each Contracting Party may permit all the periods referred to in subparagraphs (ii) and (iii) above to be recorded under the sign on the record sheets used on vehicles registered in its territory. b) It must be possible, from the characteristics of the traces, their relative positions and if necessary the signs laid down in paragraph 4 a) to distinguish clearly between the various periods of time. c) In the case of vehicles with a crew consisting of more than one driver, the recordings provided for in paragraph 4 a) must be made on two separate sheets, each sheet being allocated to one driver. In this case, the forward movement of the separate sheets must be effected either by a single mechanism or by separate synchronized mechanisms. 2. Each opening of the case containing the record sheet or sheets and the control of the mechanism for resetting the clock must be automatically recorded on the sheet or sheets. the measurement range of the speedometer in the form „Vmin ... km/h, Vmax ... km/h”. This marking is not necessary if it is shown on the descriptive plaque of the equipment. However, these requirements shall not apply to control devices approved before 10 August 1970.
where α is the angle measured from the horizontal position of the front face (fitted the right way up) of the equipment for which the instrument is calibrated, while β and γ represent respectively the maximum permissible upward and downward deviations from the angle of calibration. ±two minutes per day with a maximum of 10 minutes per 7 days in cases where the running period of the clock after rewinding is not less than that period. ±10 minutes per seven days. 4. The maximum tolerances set out in paragraphs 1, 2 and 3 are valid for temperatures between 0 and 40 °C, temperatures being taken in close proximity to the equipment. 5. Measurement of the maximum tolerances set out in paragraphs 2 and 3 shall take place under the conditions laid down in Chapter VI. e) the time of any change of vehicle. one or more areas for data relating to driving time, to other periods of work and availability to breaks from work and to rest periods for drivers. 2. The area for recording speed must be scaled off in divisions of 20 kilometres per hour or less. The speed corresponding to each marking on the scale must be shown in figures against that marking. The symbol „km/h” must be shown at least once within the area. The last marking on the scale must coincide with the upper limit of the range of measurement. By way of minimal additional requirements, each sheet must bear, in printed form a timescale graduated in such a way that the time may be read directly at intervals of 15 minutes while each 5 minute interval may be determined without difficulty. 1. The control device must be positioned in the vehicle in such a way that the driver has a clear view from his seat of speedometer, distance recorder and clock while at the same time all parts of those instruments, including driving parts, are protected against accidental damage. 2. It must be possible to adapt the constant of the control device to the characteristic coefficient of the vehicle by means of a suitable device, to be known as an adaptor. Vehicles with two or more rear axle ratios must be fitted with a switch device whereby these various ratios may be automatically brought into line with the ratio for which the control device has been adapted to the vehicle. 3. After the control device has been checked on installation, an installation plaque shall be affixed to the vehicle beside the device or in the device itself and in such a way as to be clearly visible. After every inspection by an approved fitter or workshop requiring a change in the setting of the installation itself, a new plaque must be affixed in place of the previous one. the dates on which the characteristic coefficient of the vehicle was determined and the effective measured circumference of the wheel tyres. f) the casings required under Chapter III A 7 b). In particular cases, further seals may be required on approval of the control device type and a note of the positioning of these seals must be made on the approval certificate. Only the seals mentioned in b), c) and e) may be removed in cases of emergency; for each occasion that these seals are broken a written statement giving the reasons for such action must be prepared and made available to the competent authority. The Contracting Party shall nominate the bodies which shall carry out the checks and inspections. Every individual device, whether new or repaired, shall be certified in respect of its correct operation and the accuracy of its readings and recordings, within the limits laid down in Chapter III F 1, by means of sealing in accordance with Chapter V B f). For this purpose, the Contracting Party may stipulate an initial verification, consisting of a check on and confirmation of the conformity of a new or repaired device with the type approved model and/or with the requirements of this annex and its appendices or may delegate the power to certify to the manufacturers ,or to their authorized agents. When being fitted to a vehicle, the control device and the whole installation must comply with the provisions relating to maximum tolerances laid down in Chapter III F 2.
a) Periodic inspections of the control device fitted to vehicles shall take place at least every two years and may be carried out in conjunction with roadworthiness tests of vehicles. b) An inspection to ensure compliance with the provision of Chapter III F 3 on the maximum tolerances in use shall be carried out at least once every six years, although each Contracting Party may stipulate a shorter interval for such inspection in respect of vehicles registered in its territory. Such inspections must include replacement of the installation plaque. movement of the vehicle: the vehicle must proceed, driven by its own engine, in a straight line and on a level surface, at a speed of 50 ± 5 km/h; provided that it is of comparable accuracy, the test may also be carried out on an appropriate test bench. 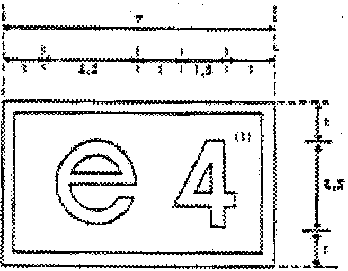 An approval number corresponding to the number of the approval certificate drawn up for the prototype of the control device or the record sheet, placed at any point within the immediate proximity of this rectangle. Note: In order to ensure in the future conformity between conventional signs in the 1958 Agreement and those set up in the AETR Agreement new Contracting Parties should be allocated the same number in both Agreements. 2. 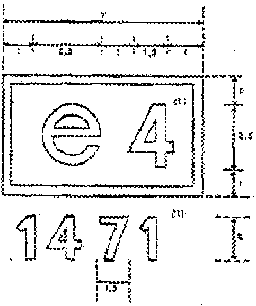 The approval mark shall be shown on the descriptive plaque of each set of control device and on each record sheet. It must be indelible and must always remain clearly legible. A Contracting Party having granted approval shall issue the applicant with an approval certificate, the model for which is given below. When informing other Contracting Parties of approvals issued or, if the occasion should arise, withdrawn, a Contracting Party shall use copies of that certificate. The Contracting Parties declare that this Agreement is without prejudice to such provisions as may, if appropriate, subsequently be drawn up in the matter of the duration and spread over of work. The provisions of article 4, paragraph 1, shall not be construed as rendering applicable, outside the State in which the vehicle performing the transport operation is registered, any prohibition of traffic on certain days or at certain hours which may apply in that State to certain categories of vehicles. The provisions of article 4, paragraph 2, shall not be construed as preventing a Contracting Party from enforcing in its territory the provisions of its domestic laws and regulations which prohibit certain categories of vehicle traffic on certain days or at certain hours. Every Contracting Party which, being a Party to a special agreement as referred to in article 4, paragraph 2, of this Agreement, authorizes international transport operations , beginning and ending in the territories of the Parties to the said special agreement by vehicles registered in the territory of a State which, being a Contracting Party to this Agreement, is not a Party to the said special agreement may make it a condition for the conclusion of bilateral or multilateral agreements authorizing such transport operations that the crews performing those operations shall, in the territories of States Parties to the said special agreement, comply with the provisions of the said special agreement. The undersigned undertake to discuss after the Agreement has entered into force the insertion therein, by means of an amendment, of a clause providing for the use of a control device of approved type which when placed on the vehicle would so far as possible replace the individual control book. - them to afford one another assistance for the purpose of imposing penalties for breaches committed. Notwithstanding paragraph 4 of the general provisions of the annex to this Agreement, Switzerland may dispense with the requirement that employers must sign the weekly reports in the individual control book. In witness whereof, the undersigned, being duly authorised there to, have signed this Protocol. Done at Geneva, this first day of July nineteen hundred and seventy, in a single copy, in the English and French languages, the two texts being equally authentic. i) menetrend szerinti járatok: meghatározott időközökben és meghatározott útvonalakon személyeket szállító járatok, amelyek az utasokat előzetesen meghatározott megállóhelyeken veszik fel és teszik le. A fuvarozási feltételeket, különösen a járatok sűrűségét, a menetrendeket, a díjszabályokat és a fuvarozási kötelezettséget a Szerződő Felek illetékes hatóságai által jóváhagyott és alkalmazásuk előtt a fuvarozó által közzétett, a járatok üzemeltetését meghatározó szabályzat, vagy ezt helyettesítő okmány határozza meg, hacsak ezeket a feltételeket törvény vagy rendelet nem szabályozza. m) pihenőidő: legalább 1 órás megszakítás nélküli időtartam, amely alatt a gépjárművezető szabadon rendelkezhet idejével. 1. A jelen Megállapodást az egyes Szerződő Felek területén minden olyan nemzetközi közúti fuvarozásra alkalmazni kell, amelyet az illető Szerződő Fél vagy bármely másik Szerződő Fél területén bejegyzett járművel végeznek. 1. Olyan árufuvarozásra használt járművek, amelyeknek (a pótkocsit vagy a félpótkocsit is beleértve) megengedett legnagyobb össztömege a 3,5 tonnát nem haladja meg. 2. Olyan személyszállításra használt járművek, amelyek felépítése és felszereltsége alapján a gépjárművezetővel együtt legfeljebb kilenc személy szállítására alkalmasak, és e célra vannak rendelve. 3. Menetrend szerinti személyszállítására használt járművek, amelyeknek menetrend szerinti útvonala az 50 kilométert nem haladja meg. 4. Olyan járművek, amelyek engedélyezett legnagyobb sebessége a 30 km/h-t nem haladja meg. 5. A fegyveres szolgálatok, polgári védelem, tűzoltóság és a közrend fenntartásáért felelős erők által használt vagy ellenőrzésük alatt álló járművek. 6. Szennyvízelvezetéssel, árvízvédelemmel, víz-, gáz- és áramszolgáltatással, közutak fenntartásával és ellenőrzésével, hulladékgyűjtéssel és ártalmatlanítással, távirat- és telefonszolgálattal, postai küldemények szállításával, rádió és televízió műsorszóró, illetve vevőkészülékek bemérésével kapcsolatban használt járművek. 7. Veszélyhelyzetekben vagy mentési műveletekben használt járművek. 8. Orvosi célokra használt különleges járművek. 9. Cirkuszi és mutatványos berendezést fuvarozó járművek. 11. Műszaki fejlesztési, javítási vagy karbantartási célú forgalombiztonsági vizsgálatokat végző járművek, továbbá forgalomba még nem helyezett új vagy átépített járművek. 12. Magáncélra használt járművekkel nem kereskedelmi forgalomban szállított áruk. 13. Mezőgazdasági üzemekből tejgyűjtésre és a tejtartályok vagy az állati takarmányozásra szánt tejtermékek mezőgazdasági üzemekbe történő szállítását végző járművek. 1. Olyan Állam területén bejegyzett járművel végzett nemzetközi közúti szállításra, amely Állam nem szerződő fele a jelen Megállapodásnak, a Szerződő Felek a saját területükön legalább olyan szigorú rendelkezéseket alkalmaznak, mint amelyeket a jelen Megállapodás 5., 6., 7., 8., 9. és 10. Cikkei meghatároznak. 2. Olyan Államban bejegyzett jármű esetén, mely nem szerződő fele a jelen Megállapodásnak, bármelyik Szerződő Fél szabadon eldöntheti, hogy a jelen Megállapodás melléklete szerinti menetíró készülék (tachográf) helyett csak a gépjárművezető által kézzel kitöltött napi adatrögzítő lapok vezetését követelje meg. Az egyes Szerződő Felek az 5-8. Cikkekben foglalt minimális követelményeknél magasabbat, vagy a maximális követelményeknél alacsonyabbat meghatározhatnak. A jelen Megállapodás rendelkezéseit azokra a gépjárművezetőkre azonban minden esetben alkalmazni kell, akik akár Szerződő, akár nem Szerződő Államban bejegyzett járművel végeznek nemzetközi közúti szállítást. 18. életév, feltéve, hogy az illető személy rendelkezik az egyik Szerződő Fél által elismert szakmai alkalmassági bizonyítvánnyal, amely igazolja a közúti áruszállításra szolgáló járművezetők részére tartott tanfolyam sikeres elvégzését. A Szerződő Felek tájékoztatják egymást az országukban hatályos minimális képzési szintekről, és az egyéb olyan érdemleges feltételekről, melyeket a jelen Megállapodás alapján a nemzetközi áruszállítást végző járművezetőktől megkövetelnek. 2. Személyszállítást végző gépjárművezetők legalacsonyabb életkora a betöltött 21. életév. c) az egyik Szerződő Fél által elismert szakmai alkalmassági bizonyítvánnyal kell rendelkezniük, mely igazolja, hogy közúti személyszállításra szolgáló járművek vezetői részére szóló oktatási tanfolyamot sikeresen elvégezték. 1. A vezetési idő teljes tartama kétnapi pihenőidő között, vagy egynapi pihenőidő és a heti pihenőidő között (a továbbiakban: „napi vezetési idő”) nem haladhatja meg a kilenc órát. Ezt heti két alkalommal tíz órára meg lehet hosszabbítani. A gépjárművezetőnek maximum hatnapi vezetési időt követően kell a 8. Cikk 3. pont értelmében heti pihenőidőt beiktatnia. A heti pihenőidőt a hatodik nap végéig el lehet halasztani, amennyiben a hat nap alatt az együttes vezetési idő nem haladja meg a hatnapi vezetési időnek megfelelő maximális időtartamot. Nem menetrend szerinti nemzetközi közúti személyszállításnál a második és harmadik bekezdésben a „hat” és „hatodik” szavakat a „tizenkettő”, illetve „tizenkettedik” szavakkal kell helyettesíteni. 2. A vezetési idő teljes tartama bármely két egymást követő hét időtartamán belül nem haladhatja meg a kilencven órát. 1. Négy és fél órás vezetési idő után a gépjárművezető legalább negyvenöt perces megszakítást köteles tartani, kivéve, ha pihenőidőt kezd meg. 2. Ez a megszakítás helyettesíthető a vezetési idő során eloszló vagy közvetlenül ezen időt követő legalább tizenöt perces megszakításokkal, oly módon, hogy az 1. pont rendelkezései teljesüljenek. 3. E megszakítások alatt a gépjárművezető nem végezhet más munkát. E cikk alkalmazásában a várakozási idő és az az időtartam, ami a járművek kompon vagy vasúton történő szállítására fordítódik, nem minősül egyéb munkának. 4. A jelen cikknek megfelelően beiktatott megszakítások nem tekinthetők napi pihenőidőnek. 1. A gépjárművezetőnek minden huszonnégyórás időszakban legalább tizenegy óra egybefüggő napi pihenőidőt kell tartania, ami hetenként maximum három alkalommal legalább kilenc egybefüggő órára csökkenthető, feltételezve, hogy a következő hét végéig ezzel egyenértékű pihenőidőt biztosítanak számára. Azokon a napokon, amikor a pihenőidő nem csökken le az 1. pont első fordulata szerint, azt két vagy három különálló időszakban lehet igénybe venni a huszonnégy órán belül, melyek közül az egyiknek legalább nyolc egybefüggő órának kell lennie. Ebben az esetekben a minimális pihenőidőt tizenkét órára kell felemelni. 2. Minden olyan harmincórás időszakra, amikor a járművön legalább két gépjárművezető van, mindegyik gépjárművezetőnek legalább nyolc óra egybefüggő napi pihenőidőt kell beiktatnia. 3. Minden héten az 1. és 2. pontban megnevezett pihenőidők egyikét heti pihenőidőként, összesen negyvenöt egybefüggő órára meg kell hosszabbítani. E pihenőidőt legalább harminchat egybefüggő órára lehet csökkenteni, ha azt a gépjárművezető a jármű rendes telephelyén vagy saját lakóhelyén tölti el, vagy legalább huszonnégy egybefüggő órára rövidíthető, ha azt máshol tölti el. Minden csökkentést az illető hetet követő harmadik hét vége előtt egybefüggően elöltött, azzal egyenértékű pihenőidővel kell kiegyenlíteni. 4. Az egyik héten kezdődő és a következő héten folytatódó heti pihenőidőt e két hét bármelyikéhez hozzá lehet kapcsolni. 5. A 6. Cikk 1. pontjának negyedik bekezdésében meghatározott személyszállításnál a heti pihenőidő átvihető a következő hétre, és hozzáadható ezen második hétre járó heti pihenőidőhöz. 6. A napi és/vagy heti pihenőidő csökkentéséért ellentételezésként eltöltött pihenőidőt hozzá kell kapcsolni egy legalább nyolc egybefüggő óra másik pihenőidőhöz, és azt az érintett személy kérésére a jármű telephelyén vagy a gépjárművezető lakóhelyén kell eltölteni. 7. A napi pihenőidő eltölthető álló (parkoló) járműben, amennyiben az fekvőhellyel ellátott és fix helyen parkol. a napi pihenőidő mindkét részét a gépjárművezető csak a járműben elhelyezett fekvőhelyen vagy a fekvőhelyes vasúti kocsiban töltheti el. Az ily módon megszakított napi pihenőidőt két órával meg kell hosszabbítani. Feltéve, hogy ez nem veszélyezteti a közúti közlekedés biztonságát, és lehetővé teszi megfelelő parkolóhely elérését, a gépjárművezető a személyek, a jármű vagy a rakomány biztonságának megőrzéséhez szükséges mértékben a jelen Megállapodás rendelkezéseitől eltérhet. A gépjárművezetőnek be kell jegyeznie a menetíró készülék adatrögzítő lapjára vagy a menetlevélre a jelen Megállapodás rendelkezéseitől való eltérés módját és okát. a) A menetíró készülék kialakításának, felszerelésének, használatának és vizsgálatának a jelen Megállapodás és a jelen Megállapodás elválaszthatatlan részét képező melléklet követelményeinek kell megfelelni. Azt a menetíró készüléket, amelynek kialakítása, felszerelése, használata és vizsgálata megfelel a Tanács 1985. december 20-i, 3821/85. sz. (EGK) rendeletében foglalt előírásoknak, úgy kell tekinteni, mint amely megegyező e cikk követelményeivel. b) Ha a járműre felszerelt menetíró készüléket nem lehet a megszokott és megfelelő módon használni, úgy a személyzet minden tagja köteles az adatrögzítő lapjára megfelelő grafikus jelzéssel, kézírással feljegyezni szakmai tevékenysége időszakaira és a pihenőidőre vonatkozó adatokat. c) Ha a járműtől való távollétük miatt a személyzet tagjai nem tudják a készüléket használni, úgy kötelesek megfelelő grafikus jelzéssel, kézírással bejegyezni adatrögzítő lapjukra, a távollétükben végzett munkaköri tevékenységeiknek megfelelő különböző időpontjait. d) A személyzet tagjai kötelesek mindig maguknál tartani és ellenőrzéskor betekintésre bemutatni a folyó hétre, és az előző hét utolsó napjára szóló adatrögzítő lapokat, amikor vezettek. e) A személyzet tagjainak gondoskodniuk kell arról, hogy a menetíró készülék működőképes és megfelelően kezelhető legyen, valamint a meghibásodott készüléket a lehető legrövidebb időn belül megjavítsák. 2. A munkáltató megfelelő számú adatrögzítő lapot köteles a gépjárművezetőknek átadni, figyelembe véve, hogy e lapok személyre szólók, a szolgálat időtartamát, valamint azt, hogy a sérült vagy az ellenőrző szervek által lefoglalt lapokat esetlegesen pótolni kell. A munkáltató csak a jóváhagyott mintapéldány szerinti, a járműre felszerelt készülék használatára alkalmas lapokat adhat át a gépjárművezetőknek. 3. A munkáltató a jelen cikk 1. pontjának b), c) és d) bekezdései szerint kitöltött adatrögzítő lapokat az utolsó bejegyzés keltétől számított legalább 12 hónapig kötelesek gondosan megőrizni, és azokat az ellenőrző hatóságok kérésére bemutatni. 3. Tilosak a munkabérben részesülő gépjárművezetők részére még prémium vagy bérkiegészítés formájában is azok a plusz kifizetések, amelyek a megtett távolsággal és/vagy a szállított áruk értékösszegével függnek össze, kivéve, ha e kifizetések jellegüknél fogva nem veszélyeztetik a közúti közlekedés biztonságát. 1. Az egyes Szerződő Felek minden szükséges intézkedést megtesznek a jelen Megállapodás rendelkezései megtartásának biztosítására, különösen a közutakon és a vállalkozások telephelyein végzett ellenőrzések útján. A Szerződő Felek illetékes hatóságai folyamatosan tájékoztatják egymást az e célból meghozott általános intézkedésekről. 2. A Szerződő Felek segítséget nyújtanak egymásnak a jelen Megállapodás alkalmazásában és annak ellenőrzésében. azokról a bírságokról, amelyeket azokra a belföldi gépjárművezetőkre róttak ki, akik a Szerződő Fél területén követtek el ilyen jellegű jogsértést. Súlyos jogsértés esetében az információnak a kirótt bírság összegét is tartalmaznia kell. 4. Ha valamely Szerződő Fél területén bejegyzett jármű vezetőjének közúti ellenőrzésekor olyan jogsértéseket állapítanak meg, amelyek megfelelő adatok hiányában az adott ellenőrzéskor nem tárhatók fel, az érintett Szerződő Felek illetékes hatóságai kölcsönösen segítik egymást a helyzet tisztázásában. Az esetben, ha ennek érdekében az illetékes Szerződő Fél a vállalkozás telephelyén folytat vizsgálatot, ezen ellenőrzés eredményét közölnie kell a másik érintett Féllel. Az új 10. Cikk - Menetíró készülék - rendelkezései válnak kötelezővé a jelen Megállapodásban szereplő Szerződő Felek számára 1995. április 24-ig. Ezen időpontig érvényben maradnak a régi 12. Cikk - Egyéni ellenőrző könyv - és a régi 12. bis Cikk - Menetíró készülék - rendelkezései. 1. A jelen Megállapodás 1971. március 31-ig aláírásra, és azt követően csatlakozásra nyitva áll az Európai Gazdasági Bizottság tagországai és a Bizottságba tanácskozási minőségben felvett Államok részére a Bizottság hatáskörét megállapító dokumentum 8. pontja alapján. 2. A jelen Megállapodást ratifikálni kell. 3. A ratifikálási vagy csatlakozási okmányokat az Egyesült Nemzetek Főtitkáránál kell letétbe helyezni. 4. A jelen Megállapodás nyolcadik ratifikálási vagy csatlakozási okmány letétbe helyezési időpontját követő száznyolcvanadik napon lép hatályba. 5. Minden olyan Állam tekintetében, amely a nyolcadik ratifikálási vagy csatlakozási okmány jelen cikk 4. pontja szerinti letétbe helyezését követően ratifikálja a jelen Megállapodást vagy csatlakozik ahhoz, a jelen Megállapodás az azt követő száznyolcvanadik napon lép hatályba, miután ezen Állam letétbe helyezte ratifikálási vagy csatlakozási okmányát. 1. Bármely Szerződő Fél jelen Megállapodást az Egyesült Nemzetek Főtitkárához intézett jegyzékkel felmondhatja. 2. A felmondás hat hónappal azon időpont után válik hatályossá, amikor a Főtitkár a vonatkozó jegyzéket kézhez vette. A jelen Megállapodás hatályát veszti, ha a hatálybalépése után a Szerződő Felek száma bármely egymást követő tizenkét hónapon át háromnál kevesebb. 1. A jelen Megállapodás aláírásának, illetve ratifikálási vagy csatlakozási okmányának letétbe helyezése időpontjában vagy azt követően bármikor bármely Állam az Egyesült Nemzetek Főtitkárához intézett értesítéssel kinyilváníthatja, hogy a jelen Megállapodás hatályát kiterjeszti azokra a területekre, vagy azok egy részére, amelyeket nemzetközi téren képvisel. Az értesítésben megnevezett terület(ek)re a jelen Megállapodás azon időpontot követő száznyolcvanadik naptól kezdődően alkalmazandó, amikor a Főtitkár ezt az értesítést kézhez vette, vagy ha a jelen Megállapodás e napon még nincs hatályban, úgy a hatálybalépés napjától kezdődően. 2. Bármely Állam, amely az előző pontban foglaltak szerint olyan nyilatkozatot tett, hogy a jelen Megállapodást alkalmazni kívánja az általa nemzetközi téren képviselt területre is, a jelen Megállapodást e területre külön is felmondhatja a jelen Megállapodás 15. Cikke szerint. 1. A jelen Megállapodás értelmezésével vagy alkalmazásával kapcsolatban két vagy több Szerződő Fél között felmerült nézeteltérést - amennyire lehetséges - a Felek közötti tárgyalások útján kell rendezni. 2. A tárgyalások útján nem rendezett nézeteltérést a szemben álló Felek bármelyikének kérésére választott bírósági eljárás alá kell vetni, és a szemben álló Felek közös megegyezése alapján kijelölt egy vagy több választott bíró elé kell utalni. Ha a választott bírósági eljárás iránti kérelem benyújtásának időpontjától számított három hónapon belül a szemben álló Felek nem tudnak megállapodni a választott bíró vagy bírák kijelölésében, e Felek bármelyike kérheti az Egyesült Nemzetek Főtitkárát, hogy jelöljön ki egyesbírót, aki elé kell majd terjeszteni a vitás esetet döntés céljából. 3. A perben álló Szerződő Felekre az előző pont alapján kijelölt választott bíró vagy bírák ítélete kötelező. 1. A jelen Megállapodás aláírásakor, ratifikálásakor vagy az ahhoz történő csatlakozáskor bármely Állam kinyilváníthatja, hogy nem tekinti kötelezőnek a jelen Megállapodás 18. Cikkének 2. és 3. pontját. A többi Szerződő Felet az említett pontok nem kötelezik azzal a Szerződő Féllel szemben, amely ilyen fenntartással élt. 2. Ha ratifikálási vagy csatlakozási okmányának letétbe helyezésekor az Állam, a jelen cikk 1. pontjában meghatározottól eltérő fenntartással él, az Egyesült Nemzetek Főtitkára közli ezt a fenntartást azokkal az Államokkal, amelyek korábban helyezték letétbe ratifikálási vagy csatlakozási okmányaikat, és azóta sem mondták fel a jelen Megállapodást. A fenntartást elfogadottnak kell tekinteni, ha e közléstől számított hat hónapon belül az említett Államok egyike sem ellenzi annak elfogadását. A fenntartás egyébként elutasításra kerül, és amennyiben az illető Állam fenntartását nem vonja vissza, e tagállam ratifikálási vagy csatlakozási okmányának letétbe helyezése nem lesz joghatályos. A jelen pont alkalmazásában figyelmen kívül kell hagyni azon Államok ellenzését, amelyeknek a csatlakozása vagy ratifikálása fenntartásai miatt a jelen pont értelmében nem joghatályos. 3. Az a Szerződő Fél, amelyik a jelen Megállapodás aláírási jegyzőkönyvében fenntartást jegyzett be, vagy amely a jelen cikk 1. pontja szerinti fenntartással élt, vagy olyan fenntartást tett, amelyet a jelen cikk 2. pontja szerint elfogadtak, ezt a fenntartást a Főtitkárhoz intézett jegyzékkel bármikor visszavonhatja. 1. A jelen Megállapodás három éven át való hatályban létét követően bármely Szerződő Fél az Egyesült Nemzetek Főtitkárához intézett értesítésében kérheti, hogy értekezletet hívjanak össze a jelen Megállapodás felülvizsgálatára. A Főtitkár erről a kérésről valamennyi Szerződő Felet értesíti, és a felülvizsgálati értekezletet összehívja, ha az általa küldött értesítés keltétől számított négy hónapon belül a Szerződő Felek legalább egyharmada közölte, hogy ehhez a kérelemhez hozzájárul. 2. Ha az előző pont értelmében értekezletet hívnak össze, a Főtitkár erről valamennyi Szerződő Felet értesíti, és felhívja őket, hogy három hónapon belül terjesszék be javaslataikat, amelyek vizsgálatát az értekezleten szükségesnek tartják. A Főtitkár az értekezlet megnyitása előtt legkésőbb három hónappal valamennyi Szerződő Féllel közli az értekezlet előzetes napirendjét és a beterjesztett javaslatokat. 3. A Főtitkár a jelen cikk alapján összehívott értekezletre a jelen Megállapodás 14. Cikkének 1. pontjában említett valamennyi Államot meghívja. 1. Bármely Szerződő Fél a jelen Megállapodás egy vagy több pontjának módosítását javasolhatja. Az Egyesült Nemzetek Főtitkárával közölni kell a javasolt módosítás szövegét, aki azt valamennyi Szerződő Féllel közli, és arról a jelen Megállapodás 14. Cikkének 1. pontjában említett többi Államot tájékoztatja. b) bár a javaslat elfogadása szándékában áll, annak elfogadáshoz a szükséges feltételek azonban saját Államában még nem teljesültek. 3. Ha valamelyik Szerződő Fél a jelen cikk 2. b) pontjában meghatározott közlést küld a Főtitkárnak, mindaddig, amíg nem értesítette a Főtitkárt a módosító javaslat elfogadásáról, a módosító javaslattal szemben a közlésre előírt hat hónapos határidő elteltétől számított kilenc hónapon belül ellenvetés tehető. 4. Ha a módosító javaslattal szemben a jelen cikk 2. és 3. pontja szerint ellenvetést tettek, a módosítást úgy kell tekinteni, mint amelyet nem fogadtak el és az nem hatályos. a jelen cikk 3. pontjában jelzett kilenc hónapos határidő elteltével. 6. Minden módosítás három hónappal azon időpontot követően lép hatályba, amikor azt elfogadottnak tekintik. 7. A Főtitkár a lehető legrövidebb időn belül értesíti valamennyi Szerződő Felet, hogy tettek-e ellenvetést a módosító javaslattal szemben a jelen cikk 2. a) pontja alapján, és hogy valamelyik Szerződő Fél a jelen cikk 2. b) pontja szerinti közlést intézett-e hozzá. Ha egy vagy több Szerződő Fél tett ilyen közlést, a Főtitkár ezt követően értesíti valamennyi Szerződő Felet arról, hogy e Szerződő Fél vagy Felek, amely, illetve amelyek ilyen közlést tettek, kifogást emelnek-e a módosító javaslattal szemben vagy elfogadják azt. 8. Függetlenül a jelen cikk 1-6. pontjában meghatározott módosítási eljárástól, a jelen Megállapodás mellékletét módosítani lehet valamennyi Szerződő Fél illetékes hatóságai közötti megegyezés útján is. Ha valamely Szerződő Fél illetékes hatósága kijelentette, hogy belső jogszabályai alapján a hozzájárulásának érvényessége külön felhatalmazástól vagy a törvényhozó szerv jóváhagyásától függ, az érintett Szerződő Fél illetékes hatóságának hozzájárulását e melléklet módosításához csak akkor lehet megadottnak tekinteni, ha az illetékes hatóság értesíti a Főtitkárt, hogy a szükséges felhatalmazást vagy jóváhagyást megkapta. Az illetékes hatóságok közötti megegyezésben meg kell határoznia a melléklet módosításának hatálybalépési időpontját, és azt is ki lehet mondani, hogy az átmeneti idő alatt a régi melléklet a módosított melléklet mellett egészben vagy részben hatályban marad. 1. A jelen Megállapodás mellékletének 1. és 2. függeléke a jelen cikkben meghatározott eljárással módosítható. 2. A Szerződő Fél kérelmére a jelen Megállapodás mellékletének 1. és 2. függelékében javasolt módosításokat az Európai Gazdasági Bizottság Közúti Közlekedési Főmunkacsoportja véleményezi. 3. Ha a módosítást a jelenlévő és szavazó tagok többsége elfogadja, és e többség magában foglalja a jelenlévő és szavazó Szerződő Felek többségét, a Főtitkár közli a módosítást valamennyi Szerződő Fél illetékes hatóságával elfogadás céljából. 4. A módosítás elfogadásra kerül, ha a módosítás keltét követő hat hónapon belül a Szerződő Felek illetékes hatóságainak kevesebb, mint egyharmada értesíti a Főtitkárt a módosítással kapcsolatos kifogásáról. 5. A Főtitkár valamennyi Szerződő Féllel közli az elfogadott módosítást, és az értesítés keltétől számított három hónap leteltével lép hatályba. g) bármely módosítás jelen Megállapodás 21. Cikke szerinti hatálybalépéséről. A jelen Megállapodás - elválaszthatatlan részét képező - Aláírási Jegyzőkönyvnek ugyanaz a hatálya, érvénye és érvényességi időtartama, mint magának a jelen Megállapodásnak. A jelen Megállapodás eredeti példányát 1971. március 31. után letétbe kell helyezni az Egyesült Nemzetek Főtitkáránál, aki arról hitelesített másolatokat küld a jelen Megállapodás 14. Cikke 1. pontjában említett valamennyi Államnak. A menetíró készülék típusának vagy az adatrögzítő lap mintapéldányának jóváhagyására irányuló kérelmeket a megfelelő leírással együtt a gyártó vagy megbízottja nyújtja be a Szerződő Félhez. A menetíró készülék bármely típusának vagy az adatrögzítő lap bármely mintapéldányának jóváhagyására vonatkozó kérelmet csak egy Szerződő Félhez lehet benyújtani. A Szerződő Fél bármilyen típusú menetíró készülékhez, illetve adatrögzítő lap mintapéldányához adja meg jóváhagyását, amely megfelel a jelen melléklet 1. függelékében rögzített követelményeknek, feltéve, hogy a Szerződő Félnek módjában áll ellenőrizni, hogy a sorozatgyártási modellek megfelelnek a jóváhagyott prototípusnak. A jóváhagyott minta bármely módosításához vagy kiegészítéséhez újabb típusjóváhagyást kell kérni attól a Szerződő Féltől, amely az eredeti típusjóváhagyást engedélyezte. A Szerződő Felek a kérelmező részére jóváhagyási jelet adnak ki, amelynek egyeznie kell a 2. függelékben feltüntetett mintára menetíró készülék mindegyik típusa vagy az adatrögzítő lap mindegyik mintapéldánya tekintetében, amelyet a 2. Cikk értelmében jóváhagynak. Azon Szerződő Fél illetékes hatóságai, amelyhez típusjóváhagyás iránti kérelmet nyújtottak be, az általuk jóváhagyott vagy elutasított minden egyes menetíró készüléktípus vagy adatrögzítő lap-mintapéldány esetében, vagy megküldik egy hónapon belül a többi Szerződő Fél hatóságaihoz a jóváhagyásról kiállított bizonyítvány és a megfelelő leírás egy-egy példányát, vagy elutasítás esetén értesítik e hatóságokat az elutasításról és annak okairól. 1. Ha valamely Szerződő Fél, amely a 2. Cikk szerinti típusjóváhagyást engedélyezte, megállapítja, hogy bizonyos, általa kibocsátott típus-jóváhagyási jellel ellátott menetíró készülék vagy adatrögzítő lap nem felel meg az általa jóváhagyott prototípusnak, meghozza a szükséges intézkedéseket annak érdekében, hogy a sorozatgyártási minták megfeleljenek a jóváhagyott prototípusnak. A megtett intézkedések szükség esetén a típusjóváhagyás visszavonására is kiterjedhetnek. 2. A típusjóváhagyást kiadó Szerződő Fél abban az esetben vonja vissza a jóváhagyást, ha a jóváhagyott menetíró készülék vagy adatrögzítő lap nem felel meg a jelen mellékletben vagy függelékeiben foglaltaknak, vagy a használat során olyan általános hibát mutat, amely alkalmatlanná teszi a rendeltetésszerű használatra. 3. Ha a típusjóváhagyást kiadó Szerződő Felet egy másik Szerződő Fél értesíti az 1. és 2. pontban említett esetek valamelyikéről, akkor az utóbbi Szerződő Féllel történt konzultációt követően ő is köteles megtenni az 1. és 2. pontokban meghatározott intézkedéseket az 5. pontban foglaltak figyelembevételével. 4. Az a Szerződő Fél, amely meggyőződik arról, hogy a 2. pontban hivatkozott esetek valamelyike felmerül, további értesítésig megtilthatja a menetíró készülék vagy az adatrögzítő lapok forgalomba hozatalát és üzembe helyezését. Ugyanez vonatkozik az 1. pontban említett esetekben az előzetes ellenőrzés alól mentesített menetíró készülékre vagy adatrögzítő lapokra, ha a gyártó megfelelő figyelmeztetés ellenére sem hozza összhangba az eszközt a jóváhagyott modellel vagy a jelen melléklet követelményeivel. A Szerződő Felek illetékes hatóságai valamennyi esetben egy hónapon belül értesítik egymást a típusjóváhagyás visszavonásáról vagy az 1., 2. és 3. pont alapján meghozott bármely egyéb intézkedésekről, és megjelölik azok indokait. 5. Ha a típusjóváhagyást kibocsátó Szerződő Fél vitatja a vele közölt, az 1. vagy 2. pontban meghatározott esetek bármelyikének fennállását, az érintett Szerződő Felek megkísérlik a vita rendezését. 1. Az adatrögzítő lap mintájának típusjóváhagyását kérelmező fél köteles meghatározni kérelmében a menetíró készülék azon típusát vagy típusait, amely(ek)ben a kérdéses lapot használni kívánják, és köteles az ilyen típusú készülék(ek)et rendelkezésre bocsátani a lap vizsgálatához. 2. Az egyes Szerződő Felek illetékes hatóságai feltüntetik az adatrögzítő lap mintapéldányára vagy a típus-jóváhagyási engedélyt vagy a menetíró készülék azon típusát (típusait), amely(ek)ben a mintalap használható. Egyik Szerződő Fél sem tagadhatja meg a menetíró készülékkel felszerelt jármű nyilvántartásba vételét, vagy nem tilthatja meg az ilyen jármű üzembe helyezését vagy használatát a menetíró készülékkel kapcsolatos okból, ha a készülékre elhelyezték a 3. Cikkben említett típus-jóváhagyási jelet és a 9. Cikkben említett felszerelési táblát. A menetíró készülék típusának vagy az adatrögzítő lap mintapéldányának jelen melléklet szerinti típusjóváhagyását elutasító vagy visszavonó határozatnak részletesen tartalmaznia kell azokat az indokokat, amelyek az elutasítás vagy a visszavonás alapjául szolgáltak. A határozatot közölni kell az érintett féllel, akit egyidejűleg tájékoztatni kell a Szerződő Felek törvényei alapján rendelkezésére álló jogorvoslatokról és a jogorvoslatra rendelkezésre álló határidőkről. 1. Azok a szerelők vagy műhelyek jogosultak a menetíró készülékek felszerelésére és javítására, melyeket a Szerződő Felek illetékes hatósága ebből a célból feljogosított, miután e hatóságok - ha úgy kívánják - meghallgatták az érintett gyártók véleményét. 2. A feljogosított szerelő vagy műhely a felhelyezett zárjelen a saját megkülönböztető jelét használja. A Szerződő Fél illetékes hatósága nyilvántartást vezet az alkalmazott megkülönböztető jelekről. 3. A Szerződő Felek illetékes hatóságai kölcsönösen átadják egymásnak feljogosított szerelők vagy műhelyek jegyzékét és az alkalmazott megkülönböztető jelek másolatát is. 4. Az 1. függelékben foglaltak szerint felerősített felszerelési táblával kell igazolni, hogy a menetíró készülék felszerelése a jelen mellékletben foglalt követelményeknek megfelel. A munkáltató és a gépjárművezető kötelesek gondoskodni a készülék előírásszerű működéséről és rendeltetés szerinti használatáról. 1. A gépjárművezetők nem használhatnak szennyezett vagy sérült adatrögzítő lapokat. A lapokat ezért megfelelő módon védeni kell. Abban az esetben, ha a bejegyzéseket tartalmazó lap megsérül, a gépjárművezetőnek azt a pótlásként használt tartaléklaphoz csatolnia kell. 2. A gépjárművezetők a szolgálatba lépésük időpontjától kezdve kötelesek az adatrögzítő lapokat minden olyan napon használni, amikor járművet vezetnek. Az adatrögzítő lapot nem szabad a napi munkaidő vége előtt kivenni, hacsak a kivételét egyébként nem engedélyezték. Az adatrögzítő lapot nem lehet hosszabb időtartam rögzítésére használni, mint amilyen időtartamra a használata szól. Ha a gépjárművezető a járműre felszerelt készüléket a járműtől való távolléte miatt nem tudja használni, abban az esetben az egyes időszakokat kézzel, automatikus rögzítéssel vagy más módon olvashatóan és a lap beszennyezése nélkül kell feljegyeznie a lapra. Ha több gépjárművezető utazik a járművön, abban az esetben annak a gépjárművezetőnek az adatrögzítő lapjára kell írni az 1. függelék II. fejezete 1-3. pontjai szerinti adatokat, aki a járművet ténylegesen vezeti. 3. A menetíró készülék kialakításának olyannak kell lennie, hogy az ellenőrzésre jogosult személy számára a készülék esetleges felnyitása után lehetővé váljék az ellenőrzés időpontját megelőző kilenc órára vonatkozó adatok leolvasása a lap tartós deformálása, megrongálása vagy beszennyezése nélkül. A menetíró készülék kialakításának további feltétele, hogy a doboz felnyitása nélkül ellenőrizhető legyen a folyamatos adatrögzítés. 4. Az ellenőrzésre jogosult személy felszólítására a gépjárművezető köteles bemutatni a folyó hét vezetéssel eltöltött napjaira, és az előző hét utolsó vezetéssel eltöltött napjára vonatkozó adatrögzítő lapokat. e) a gumiabroncsok tényleges kerülete: azon távolságok átlaga, amelyet a járművet mozgató egyes kerekek (hajtottkerekek) egy teljes fordulat során megtesznek. E távolságok mérését normál vizsgálati körülmények között (lásd a jelen függelék VI. fejezetének 4. pontját) kell elvégezni, és 1 = ... mm-ben kell kifejezni. 7. az elektronikus menetíró készülék esetében, amely a távolság- és sebességérzékelő elektromos úton közvetített jeleivel működő készülék, a regisztráló berendezés tápfeszültség-ellátásában (a világítást kivéve), valamint a távolság- és sebességérzékelő tápfeszültség-ellátásában bekövetkező 100 ezredmásodpercnél hosszabb tápfeszültség-megszakadás, továbbá a távolság- és sebességérzékelőhöz vezető jel megszakadása. Két gépjárművezető által használt járművek tekintetében a menetíró készüléknek egyidejűleg, de megkülönböztethetően és két külön lapon kell rögzítenie a 3., 4. és 5. pontban felsorolt idők adatait. egy vagy több időrögzítő készülék, amelyek megfelelnek a III. fejezet C) 4. pontjában rögzített követelményeknek. a II. fejezet 7. pontjában meghatározott elektronikus menetíró készülék esetében a távolság- és sebességérzékelő tápfeszültség-ellátásában 100 ezredmásodpercet meghaladó tápfeszültség-megszakadást, és a távolság- és sebességérzékelőhöz vezető jel megszakadását. 2. Az előzőekben felsorolt eszközök bármiféle kiegészítése nem zavarhatja a kötelezően előírt műszerek megfelelő működését vagy leolvasását. A menetíró készüléket minden ilyen természetű kiegészítő jelzőszerkezettel együtt kell jóváhagyásra benyújtani. a) A menetíró készülék valamennyi alkatrészének stabil, megfelelő mechanikus ellenállású anyagúnak, továbbá az elektromos és mágneses jellemzőkkel rendelkező anyagokból kell készíteni. b) A menetíró készülék valamely alkatrészét vagy a gyártásához felhasznált anyag mindennemű módosítását alkalmazás előtt jóváhagyásra be kell terjeszteni ahhoz a hatósághoz, amely a menetíró készülék típusjóváhagyását engedélyezte. a) A sebességmérés tartományának a típus-jóváhagyási engedélyben meghatározottak szerintinek kell lennie. b) A mérőkészülék saját frekvenciájának és csillapításának olyannak kell lennie, hogy a sebességet mutató és rögzítő műszerek a mérés tartományán belül követhessék a 2 m/s2-ig terjedő gyorsulási változásokat az elfogadott tűréshatárokon belül. a) Az óra utánállítására szolgáló mechanizmus irányítását az adatrögzítő lapot tartalmazó doboz belsejében kell elhelyezni; az adatrögzítő lapon automatikusan rögzíteni kell e doboz minden felnyitását. b) Ha az adatrögzítő lap továbbító mechanizmusát az óra működteti, akkor az óra teljes felhúzás utáni pontos működési időtartamának legalább 10%-kal hosszabbnak kell lennie, mint az adatrögzítő lappal való teljes feltöltöttség mértékének megfelelő adatrögzítési idő. a) A menetíró készülék vizuális műszereit megfelelő, nem vakító fényű világítással kell ellátni. b) A megfelelő használat biztosítása érdekében a menetíró készülék minden belső alkatrészét védeni kell a nedvesség és a por ellen. Az alkatrészeket zárjellel ellátható burkolatok alkalmazásával adathamisítás elleni védelemmel is el kell látni. a) A menetíró készüléknek legalább 0,1 kilométeres pontossággal kell mutatnia a megtett távolságot. Fontos, hogy a 100 métereket mutató számokat egyértelműen meg lehessen különböztetni az egész kilométereket mutató számoktól. b) A kilométer-számlálón lévő számoknak jól olvashatóaknak, és látható magasságuknak legalább 4 mm-nek kell lenniük. c) A kilométer-számlálónak legalább 99.999,9 kilométerig kell mutatnia az értékeket. a) A mérési tartományon belül a sebességskálát egységesen 1, 2, 5 vagy 10 km/h-s fokozatbeosztással kell ellátni. A sebességfokozat-beosztás (két egymást követő jel közötti távolság) mértéke nem haladhatja meg a skálán feltüntetett legnagyobb sebesség 10%-át. b) A mért tartományon túli részt nem kell számokkal jelölni. c) A skálán lévő, 10 km/h sebességkülönbséget jelző minden egyes térköz hosszának legalább 10 mm-nek kell lennie. d) A tűs jelzőberendezésen a tű és a menetíró készülék számlapja közötti távolságnak nem szabad meghaladnia a 3 mm-t.
Az időmérő - a menetíró készüléket kívülről nézve - jól látható legyen. Az időmérőnek tisztán olvasható, egyértelműen azonosítható értékeket kell mutatnia. a) Minden készüléket az adatrögzítő lap formájától (szalag vagy korong) függetlenül olyan jellel kell ellátni, amely lehetővé teszi az adatrögzítő lap megfelelő behelyezését oly módon, hogy az órán mutatott idő és a nyilvántartó lapon szereplő időjelzés egymásnak való megfeleltetése biztosítva legyen. b) Az adatrögzítő lapot továbbító mechanizmusnak olyannak kell lennie, hogy biztosítsa az adatrögzítő lap holtjáték nélküli mozgását, egyszerű behelyezhetőségét és eltávolíthatóságát. c) A korong alakú adatrögzítő lapok esetében a lapmozgató szerkezetet az óraműnek kell szabályoznia. Ebben az esetben a lapnak - a sebesség rögzítésére használt terület szélét jelölő gyűrű belső oldalán mérve - óránként legalább 7 milliméter sebességgel folyamatosan és egyenletesen kell forognia. A szalagos berendezés esetében, amelyben a lapmozgató szerkezetet az óramű szabályozza, az egyenes vonalú, előre haladó mozgás sebességének legalább 10 milliméter/órának kell lennie. d) A jármű megtett távolságát, sebességét és az adatrögzítő lapot vagy lapokat tartalmazó berendezés felnyitásának regisztrálása csak automatikusan történhet. a) A megtett távolság minden kilométerét az adatrögzítőn a megfelelő koordinátán legalább 1 milliméteres eltéréssel kell ábrázolni. b) A rögzített távolságadatnak a mérési tartomány felső határát elérő sebességek esetében is egyértelműen olvashatónak kell lennie. a) Az adatrögzítő lap formájától függetlenül a sebességrögzítő tűnek rendszerint egyenes vonalban és az adatrögzítő lap haladási irányához képest merőlegesen kell mozognia. az időskálán lévő jelöléseknek ugyanolyan sugarú görbével kell átszelniük az adatrögzítő területet, mint az írószerkezet által rajzolt vonal. Az időskálán lévő jelölések közti távolságnak egy órát meg nem haladó időtartamot kell ábrázolniuk. b) Az adatrögzítő lapon minden 10 km/h sebességváltozást a megfelelő koordinátán legalább 1,5 milliméteres változással kell ábrázolni. Az egyes Szerződő Felek a területükön bejegyzett járműveken használt nyilvántartólapon engedélyezhetik a fenti (ii) és (iii) bekezdésekben szereplő jelek szerint meghatározott idők rögzítését. b) Biztosítani kell, hogy a vonalak tulajdonságai, egymáshoz viszonyított helyzete és szükség esetén a 4. a) pontban meghatározott jelek alapján egyértelműen meg lehessen különböztetni egymástól a különböző időket. A különböző időtartamokat különböző vastagságú vonalakkal, illetve legalább ugyanolyan jól olvasható és értelmezhető módszer alkalmazásával kell egymástól megkülönböztetni az adatrögzítőn. c) Ha a jármű személyzete egynél több gépjárművezetőből áll, akkor a 4. a) pontban foglalt adatokat gépjárművezetőnként külön-külön lapon kell rögzíteni úgy, hogy ezek mindegyike egy gépjárművezető adatait tartalmazza. Ez esetben a külön lapok készülékben történő továbbítását egy mechanizmus vagy két különálló és összehangolt mechanizmus biztosítja. 1. Az adatrögzítő lapo(ka)t és az órabeállító mechanizmus irányítószerkezetét tartalmazó dobozt zárral kell ellátni. 2. Az adatrögzítő lapo(ka)t tartalmazó doboz minden egyes felnyitását, valamint az óraszerkezet minden vezérlését automatikusan rögzíteni kell a lapo(ko)n.
a sebességmérő mérési tartománya „Vmin ... km/h, Vmax ... km/h” formában. E jelölés nem szükséges, ha az szerepel a berendezés ismertető tábláján. E követelmények azonban nem vonatkoznak az 1970. augusztus 10. előtt jóváhagyott menetíró készülékekre. ahol α a berendezés (egyenesen felszerelt) előlapjának a vízszintes helyzethez képest mért szöge, amelyre a műszert hitelesítették, míg a β szög és a γ szög az α hitelesítési szögtől való legnagyobb megengedett felfelé, illetve lefelé irányuló eltéréseket mutatja. naponta ± két perc, 7 nap alatt maximum 10 perc, amennyiben az óra működési ideje az ismételt felhúzás után nem kevesebb ennél az időszaknál (7 nap). 4. Az 1., 2. és 3. pontban meghatározott maximális tűréshatárok a készülék közvetlen közelében mért 0 és 40 °C közötti hőmérsékletekre érvényesek. 5. A 2. és 3. pontban meghatározott maximális tűréshatárok mérését a VI. fejezetben meghatározott körülmények között kell elvégezni. 1. Az adatrögzítő lapoknak nem szabad akadályozniuk a műszer szabályos működését, és biztosítaniuk kell a rajtuk rögzített adatok kitörölhetetlenségét, könnyen olvashatóságát és azonosíthatóságát. Normális páratartalom és hőmérsékleti viszonyok mellett az adatrögzítő lapoknak meg kell őrizniük méreteiket és a rajtuk rögzített adatokat. Rendes tárolási körülmények között a bejegyzéseknek legalább egy évig pontosan olvashatóaknak kell maradniuk. 2. A lapokra - formájuktól függetlenül - legalább 24 órás időszak bejegyzéseinek rá kell férnie. Ha több korongot kapcsolnak össze a személyzet beavatkozása nélkül elérhető folyamatos adatrögzítő kapacitás növelése érdekében, a különböző korongok közötti összeköttetést oly módon kell létrehozni, hogy ne legyenek kihagyások vagy átfedések a rögzített adatokban az egyik korongról a másikra történő áttéréskor. egy vagy több terület a gépjárművezetők vezetési idejének, egyéb munkaidejének és készenléti idejének, megszakításoknak és pihenőidőinek rögzítésére. 2. A sebesség rögzítésére szolgáló területet 20 km/h-nak vagy ennél kisebb sebességnek megfelelő részekre kell osztani. A skála osztásaihoz a megfelelő sebességet számokban kell feltüntetni. A „km/h” jelet legalább egyszer fel kell tüntetni a lapnak ezen a részén. A skálán lévő utolsó jelölésnek meg kell egyeznie a mérési tartomány felső határával. 3. A megtett távolság rögzítésére szolgáló területet úgy kell kialakítani, hogy a megtett kilométerek száma egyszerűen leolvasható legyen. 4. Az 1. pontban említett idők rögzítésére fenntartott területe(ke)t úgy kell jelölni, hogy a különféle időtartamokat egyértelműen meg lehessen különböztetni egymástól. a sebességmérési tartomány felső határa, km/h-ban. További minimális követelményként minden lapon szerepelnie kell nyomtatott formában egy oly módon beosztott időskálának, hogy az idő 15 perces időközönként közvetlenül leolvasható, és minden 5 perces időköz egyszerűen meghatározható legyen. 1. A menetíró készüléket úgy kell elhelyezni a járműben, hogy a gépjárművezető az üléséről jól lássa a sebességmérőt, a kilométer-számlálót és az órát, miközben e műszerek valamennyi alkatrésze, a meghajtást végző alkatrészeket is beleértve, védve legyenek a véletlen sérülésektől. 2. Biztosítani kell, hogy a menetíró készülék állandóját egy adapternek nevezett alkalmas készülékkel hozzá lehessen igazítani a jármű jellemző együtthatójához. A két vagy több hátsóhíd-áttétellel rendelkező járműveket kapcsolószerkezettel kell ellátni, amely a különböző áttételeket automatikusan összehangolja azzal az áttétellel, amelynek alapján a menetíró készüléket a járműhöz beállították. 3. Miután a felszereléskor elvégezték a menetíró készülék ellenőrzését, egy felszerelési táblát kell jól látható helyen felerősíteni a készülék mellett, vagy magára a készülékre. Minden ellenőrzés után, amikor egy szerelő vagy egy feljogosított műhely elvégzi a készülék szükséges beszabályozását, vagy módosítását, az előző helyére egy új táblát kell felszerelni. azon időpontok, amikor a jármű jellemző együtthatóját és a gumiabroncsok tényleges mért kerületét meghatározták. f) a III. fejezet A) pontjának 7. b) bekezdése alapján előírt burkolatokat. Különleges esetekben a menetíró készülék típusának jóváhagyásakor további zárjeleket is előírhatnak, és a jóváhagyási engedélyben meg kell adni e zárjelek helyét. Szükséghelyzetben csak a b), c) és e) bekezdésekben említett zárjeleket lehet eltávolítani; a zárjelek feltörésekor minden alkalommal írásos nyilatkozatot kell készíteni a feltörés okairól, amelyet az illetékes hatóság rendelkezésére kell bocsátani. A Szerződő Fél kijelöli az ellenőrzéseket és felülvizsgálatokat végző szerveket. Minden egyes új vagy javított készüléket a helyes működése, valamint a III. fejezet F) 1. pontjában megjelölt határokon belül leolvasott és rögzített adatainak pontossága szempontjából hitelesíteni kell az V. fejezet B) f) pontja szerinti zárjelekkel. A Szerződő Fél ezért előírhat egy első beszabályozást, mely annak ellenőrzéséből és megerősítéséből áll, hogy az új vagy javított készülék megfelel a típusjóváhagyott modellnek és/vagy a jelen melléklet és függelékei követelményeinek, vagy e hitelesítési jogkört átruházhatja a gyártókra vagy azok meghatalmazottjaira. A járműre történő felszereléskor a menetíró készüléknek és az egész szerelésnek eleget kell tennie a III. fejezet F) 2. pontjában meghatározott maximális tűréshatárokra vonatkozó rendelkezéseknek. Az ellenőrző vizsgálatokat a feljogosított szerelőnek vagy műhelynek saját felelősségére kell elvégeznie. a) A járművekre felszerelt menetíró készülék időszakos felülvizsgálatát legalább kétévente kell elvégezni, ami összeköthető a járművek műszaki vizsgájával is. b) A III. fejezet F) 3. pontjában foglalt maximális tűréshatárok betartását legalább hatévente egyszer ellenőrizni kell, bár az egyes Szerződő Felek gyakrabban is előírhatják a területükön bejegyzett járművek felülvizsgálatát. A felülvizsgálat során le kell cserélni a felszerelési táblát. a jármű mozgása: a saját motorral hajtott járműnek egyenes vonalban, síkfelületen kell haladnia 50+5 km/h sebességgel; a vizsgálatot ugyanilyen pontossággal működő próbapadon is el lehet végezni. (i) A gépjármű-berendezések és alkatrészek jóváhagyásának és jóváhagyása kölcsönös elismerésének egységes feltételei elfogadásáról szóló 1958. Évi Egyezményhez csatlakozott Szerződő Felek ugyanazokat a számokat kapják, mint amelyeket ezen országok részére nevezett Egyezmény kijelöl. Egy jóváhagyási számot, amely megegyezik a menetíró készülék prototípusára vagy az adatrögzítő lap mintapéldányára vonatkozó jóváhagyási engedéllyel, amely e téglalap közvetlen közelében bárhol elhelyezhető. Megjegyzés: Az 1958. évi Egyezményben és az AETR Megállapodásban meghatározott egyezményes jelek későbbi egyezőségének biztosítása érdekében az új Szerződő Felek részére az Egyezményben és a Megállapodásban ugyanazt a számot kell kijelölni. 2. A jóváhagyási jelet fel kell tüntetni minden menetíró készülék felszerelési tábláján és minden adatrögzítő lapon. Ennek kitörölhetetlennek és mindig jól olvashatónak kell lennie. 3. Az alábbi jóváhagyási jel méretei milliméterekben vannak megadva, és a minimális méreteket jelentik. A méretek közötti arányokat meg kell tartani. (1) A számok kizárólag tájékoztató jellegűek. A jóváhagyást engedélyező Szerződő Fél a kérelmező részére jóváhagyási engedélyt állít ki, amelynek mintája az alábbiakban látható. A Szerződő Fél ezen engedély másodpéldányaival tájékoztatja a többi Szerződő Felet a kiadott engedélyekről vagy az esetleges visszavonásokról. A Szerződő Felek kijelentik, hogy a jelen Megállapodás nem érinti a munkaidő tartamának és megosztásának tárgyában esetlegesen a későbbiekben létrejövő rendelkezéseket. A 4. Cikk 1. pontjában foglalt rendelkezést nem szabad úgy értelmezni, mintha az egyik országban bizonyos típusú járművekre bizonyos napokon vagy órákban bevezetett forgalmi korlátozások a gépjárművet bejegyző országon kívül más országra is vonatkoznának. A 4. Cikk 2. pontjában foglalt rendelkezést nem szabad úgy értelmezni, mintha korlátozná valamely Szerződő Felet abban, hogy saját területén érvényt szerezzen a bizonyos típusú járművekre bizonyos napokon vagy órákban bevezetett forgalmi korlátozásokat szabályozó hazai törvények és rendeletek előírásainak. A jelen Megállapodás 4. Cikkének 2. pontjában hivatkozott külön megállapodást aláíró Szerződő Felek, amelyek engedélyezik a külön megállapodást aláíró felek területén megkezdett és befejezett nemzetközi közúti fuvarozást azon járművek számára, amelyeket a jelen Megállapodásban Szerződő Félként szereplő, de az említett külön megállapodásban nem szereplő Államban tartanak nyilván, az ilyen fajta fuvarozási műveletekre engedélyt adó kétoldalú vagy többoldalú megállapodások megkötését ahhoz a feltételhez köthetik, hogy az ilyen fuvarozási műveleteket végző járművek személyzete az említett külön megállapodást aláíró Államok területén megfeleljenek az említett külön megállapodás rendelkezéseinek. Alulírottak a jelen Megállapodás hatálybalépése után megvitatják, hogy a jelen Megállapodásba nem kellene-e egy olyan záradékot módosítással belefoglalni, amely szerint a járműbe felszerelt, jóváhagyott típusú menetíró készüléknek lehetőleg fel kellene váltania az egyéni ellenőrző könyvet. - segítséget nyújtanának egymásnak az elkövetett jogsértésekkel kapcsolatos bírságok kiszabásában. Svájc a jelen Megállapodáshoz csatolt melléklet általános rendelkezéseinek 4. pontjában foglaltaktól függetlenül mellőzheti azon előírás betartását, amely szerint a munkaadóknak alá kell írniuk az egyéni ellenőrző könyvben lévő heti jelentéseket. Ennek tanúbizonyságául az alulírottak kellő meghatalmazás birtokában aláírták a Jegyzőkönyvet. 3. § * A nemzetközi közúti fuvarozást végző járművek személyzetének munkaviszony létesítésére, munkavégzésére, továbbá a munkaidejére és pihenőidejére a munka törvénykönyvéről szóló 2012. évi I. törvényt az e törvénnyel kihirdetett Megállapodásban foglalt eltérő rendelkezésekkel kell alkalmazni. 5. § E törvény a kihirdetését követő hónap első napján lép hatályba, rendelkezéseit azonban 2000. április 19-től kell alkalmazni. A nem kívánt rész törlendő. Módosította: 2012. évi LXXXVI. törvény 49. §. Lásd: 54/2001. (IV. 10.) Korm. rendelet, 66/2007. (IV. 4.) Korm. rendelet, 156/2009. (VII. 29.) Korm. rendelet. Módosította: 2006. évi CIX. törvény 170. § (7) b). Lásd: 54/2004. (IX. 22.) BM rendelet, 43/2007. (IV. 4.) GKM rendelet, 25/2007. (V. 31.) IRM rendelet.